Gripsweat - Bruce Springsteen and related vinyl records huge joblot collection! 80+ records! 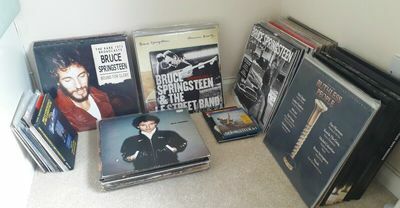 Bruce Springsteen and related vinyl records huge joblot collection! 80+ records! You are bidding on an extensive collection of Bruce Springsteen vinyl records. A rare chance to find so many titles in one listing!!!! Includes studio albums, rare bootlegs, boxsets, 12 inch singles, record store day titles, E Street band and related artist records, 7 inch singles and some misc titles. Plus a blu-ray and DVD. There are some duplicates on the studio albums. I usually looked for a better quality version of these albums, so at east one or two of them are in great condition. No titles here are in bad shape. There is a Japanese pressing of The River, a rare bootleg 'Piece de Resistance', The RSD title American Beauty and some Southside Johnny all the way from a live concert in New York. If you want any specific cat numbers or more details please get in touch with me. I will only be selling as a complete set. Collection is advised as the weight is 35kg, or buyer will need to pay for the courier postage. Hopefully the pictures show 90% of the titles.